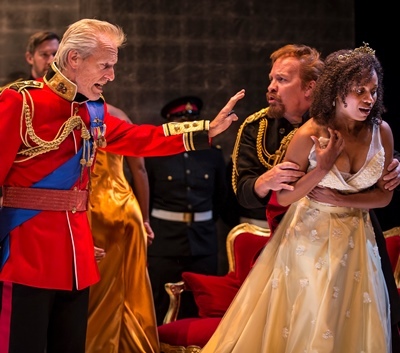 Were it not for Larry Yando’s crushing turn in the title role, Chicago Shakespeare Theater’s “King Lear” would amount to little more than an ill-advised concept played out by a cast that largely misses both the pulse and the pressure of Shakespeare’s language. Setting aside for the moment this production’s manifold curiosities, at its core reigns the regal figure of Yando, whose portrait of Lear – as imperious fool stripped to his humiliated soul – is an experience not to be missed. The beginning and end of any Shakespeare play is the text, the word, its urge and resonance. And all the wrenching force, every ironic nuance of Yando’s performance springs from his attention to word and phrase, pitch and rhythm. This tale of a ruler undone by his own vanity and recklessness commences with the king in his advanced years, arguably – and critically posited in this production – at the onset of dementia. 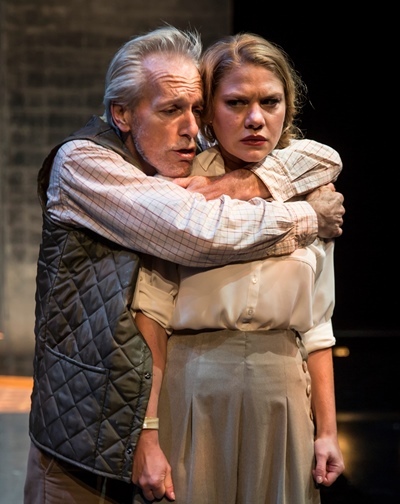 To unburden himself of the weight and pressure of rule, Lear gives away all his property, means and authority to his three daughters – or rather to two of them, Goneril and Regan, who respond lavishly his question about their love for him. When his youngest child and his favorite, Cordelia, says she will add “nothing” beyond proper filial piety, Lear flies into a rage, cuts her off with commensurate nothing and casts her into undowered marriage with the sympathetic king of France. But Lear’s awakening comes early, and it is beyond rude. Daughters Goneril and Regan both deny his royal and paternal prerogatives, refusing to house him with his personal retinue. Demeaned and mortified, the now ex-king slinks away like a dog to endure rough nature and answer its rage with his own. He is left with just two real friends – his courtly Fool, no less wise than faithful, and the former Duke of Kent, whom Lear has banished for his defense of Cordelia but who has disguised himself to gain service with the fallen king. Yando’s tracery of Lear’s fateful misstep with Cordelia, his abuse at the hands of false-swearing daughters and his crazed, half-naked exposure on the stormy heath is a mesmerizing, heart-breaking, magnificent thing to watch. Yando makes a palpable descent from absolute authority to meek subjugation to the irreducible condition that so compels Lear in the first place – nothingness. And in that crucible, that dehumanizing null, this king of nothing meets his second self – a grungy figure of a man who lives in a cave and goes by the name of Poor Tom. In fact, he is Edgar, son of the Earl of Gloucester, fled to this abyss of anonymity when he is framed for treason by his conniving illegitimate half-brother Edmund. When Lear beholds Poor Tom, babbling and nearly naked, he utters one of Shakespeare’s most disarming lines, which Yando’s broken monarch delivers with stunning genuinity: “Hast thou given all to thy two daughters, and art thou come to this?” It is the play’s thematic conceit, and in Yando’s artless candor it stamps his embodiment of a man bereft of purpose, spirit, hope. 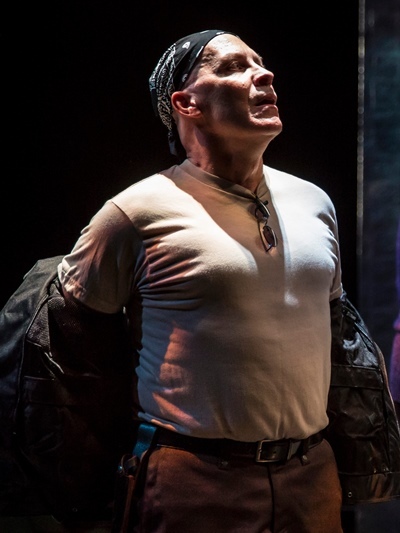 Yando’s sterling performance is companioned by three other well-measured portraits – Kevin Gudahl’s stalwart and expansive Kent, Ross Lehman’s droll but honest Fool and Michael Aaron Lindner’s Gloucester, tormented and ultimately destroyed. 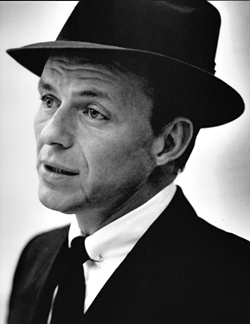 In a little prefatory scene, our contemporary Lear is clicking through tracks on a Sinatra CD – all bluesy numbers and all annoying to his Kingship, until he hits on, well, I won’t spoil that. But it’s a song befitting the top banana’s image of himself. There’s this other song, however, the really sad “Angel Eyes,” and it will keep intruding on Lear’s reeling mind. 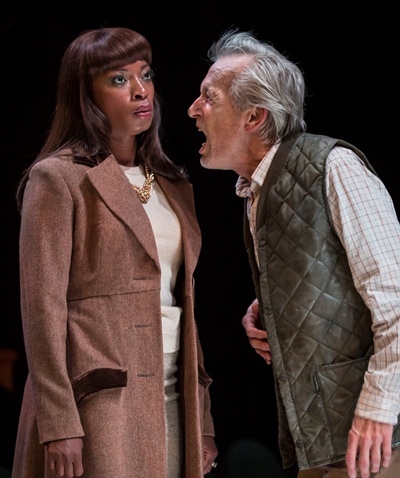 It’s perfectly reasonable to assume that Lear is teetering into mental decline, that his decision to give everything away is irrational and that ensuing events push him over the edge. That much can be read in the text. But embroidering Shakespeare with external lyrics is an inherently bad idea. At minimum, to keep showing us how poor, mad Lear’s mind is ringing with old Sinatra songs is superfluous, obvious and cheap – and I say that as a life-long Sinatra fan. Then the director gives the Chairman the last chorus, where one wishes only for the knell of kingly silence. But it wasn’t Sinatra’s music that most troubled these ears. It was the unmusical discourse among a group of actors who subjected Shakespeare’s language to a sort of postmodern rant. This was a verbal steam-rolling by players seemingly unconcerned with the impulse and drive of the words they were spewing. It could have been dialogue from any TV drama coming from Bianca LaVerne Jones and Jessiee Datino as Goneril and Regan, Nehassaiu deGannes as Cordelia, Jesse Luken as Edmund and Steve Haggard as Edgar. If this was Americanized Shakespeare, I vote for voiding the Revolution. The show does boast an appealingly efficient set design by Mark Bailey, who also created the altogether striking costumes. Michael Gend’s adept lighting makes a key contribution as well. As for Lindsay Jones’ evocative sound design– well, the stormy crack that crashes down on Lear’s bare head might uncrown any king.